Thailand is a great introduction to Asia for kids. If it is not your first stop, you could time it as calming rest stop after more challenging countries (like India). It is clean, well run, most of the people you encounter speak english or can point you in the direction of someone who does. The food is terrific and can be slanted to any level of spiciness, but if you have the ultimate picky eater, western food is usually available and white rice always is. Here are ten suggestions of things kids will especially love. 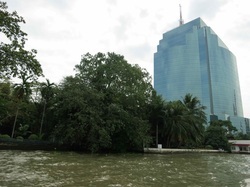 One of the best and cheapest things to do with kids in Bangkok is to get from place to place via the river. More importantly, it is super fun and cheap ride (about 15 baht a person - fifty cents). Since they go in one straight line you can get on anywhere and when you decide to get off, just grab the next one going in the opposite direction to return to where you started. But besides sightseeing they are actually a very efficient way of getting around bangkok. Traffic is uniformly horrendous so it most often quicker to get from Wat Pho to Chinatown by boat rather than taxi. 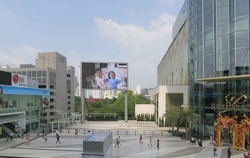 Bangkok is chock-a-block with Wats but never overlook the value of a good mall. Siam or Paragon malls are two of the world’s best (don’t miss the Kinokunya bookstore). You may think I have not traveled half way across the globe for a shopping center but you have not seen one of these babies. They have food courts that rival five star dining at street food prices. They have a giant flat screen TV outside showing movies. Generally there is some cultural show with singing and dancing or arts exhibition going on. Finally air conditioning and unlimited access to ice cream is never something to be sneered at in 90 degree heat. This leads to a little known fact - one of the best aquariums we have ever visited is in the basement of the Paragon Mall. We went there for my son’t 13th birthday and he pronounced it “awesome”. Actually all my kids loved it from the 8 to the 18 year old so much we went twice. The tunnel of sharks you walk through is particularly impressive and overall the exhibits are very informative. It is well worth a visit and you can count it as a school day! Having now taken trains in India, China and Thailand I can definitely say Thailand wins hands down for comfort and ease. 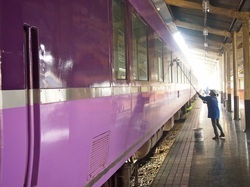 The classic ride from Bangkok to Chaing Mai starts at a family friendly 7:30 pm and arrives at 9:45 versus the usual midnight or 1 am send off or 5 am arrival times of most night trains. Moreover, you have a large comfy cabin of four berths that each have their own privacy curtains which my kids loved. Personally I loved the mat and the linens the attendant laid out - we almost didn’t need the sleep sacks that had been so essential in India. There is also a restaurant car and porters coming by asking if we wanted to order dinner or breakfast in our compartment (which we didn’t since we had gone hog wild on snacks at a supermarket in Bangkok). One of the things we choose to do in each country was take a cooking class. Our kids have learned not only to safely weld a knife or add ingredients to a stir fry, they have also learned to grate fresh coconut, make leaf baskets for steaming fish, pound spices to a paste with a mortar and pestle and cook sticky rice in bamboo tubes. For kids younger than 9 or 10 I would recommend splitting into adult/child pairs so you can closely oversee their chopping. One of the best parts of the classes is the walk through the local market usually included with a guide who can explain what all the weird and wonderful indigenous flora and fauna. Hands down the most beautiful cooking course we took was at Thai Farm Cooking School in Chiang Mai. We were driven to a lovely farm on the outskirts of town where we were able to pick and taste the traditional Thai herbs and vegetables like galangal, holy basil and lemongrass. 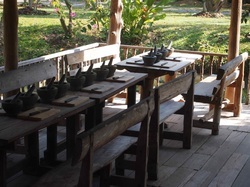 The actual cooking stations were on a platform above a peaceful waterlily pond. We ate as much of our own cooking as we could but there was so much we took the rest back to the guest house where our hostess heated it up for us for dinner and lunch the next day. There are a few once in a lifetime moments but getting into a cage with a tiger has to be one of them. The Tiger Kingdom in Chaing Mai is so well run that, tho still slightly terrifying, you are never in any kind of danger. The handlers know their business and their animals. 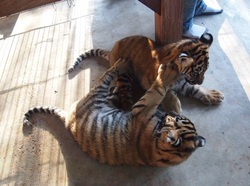 Kids under 15 are only allowed to be with the very youngest tigers - the adorable 4 to 6 month old babies who chase and pounce on each other like puppies. It is up to adults to decide what size tiger they want to get close and personal with. Amazingly even the biggest are only 2 years old since after that they become old enough to mate and must be separated individually. These teenagers are quite big enough to dwarf a fully grown man so my 18 year daughter choose the mid size which she found both hair raising and empowering to be close enough to to touch. If you are in Chiang Rai, maybe to go trekking, maybe to cross into Laos, don’t just pass through this town. 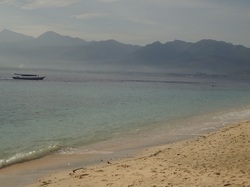 It is a lovely place with one world class attraction kids will love. 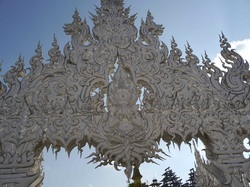 The White Temple is a brand new, still developing Thai Wat that is unlike any other you will visit in Thailand - skulls hang from trees, arms reaching up from a moat. Even the most templed out kid will be fascinated by the Where’s Waldo inner mural where they can pick out Batman and Pokemon figures as well as George Bush and Osama Bin Laden. Don’t forget to write a prayer or thanksgiving on one of the silver leaves that dangle from blessing tree. 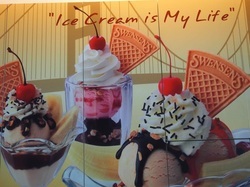 One of the other great charms of Chiang Rai is the local Swensens. I remember this local ice cream parlor from my youth in New York City but it seems to have almost totally died out in the states. 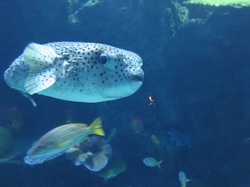 Somehow though it survives in South East Asia and can be found in several locations in Thailand and Cambodia. The flavors and elegant concoctions are among the best in the world and make an excellent special treat for the kids. Kanchanaburi is only a bus ride from Bangkok but still not on the hard and fast tourist trail. In just a couple of hours you can be sitting on a bamboo porch overlooking the Mekong surrounded by greenery instead of Bangkok’s shiny malls and sky scrapers. 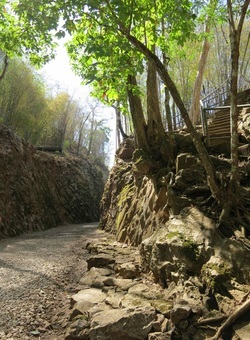 Kanchanaburi’s claim to fame is the railroad track that Australian, British and other allied soldiers were forced to hack out of the jungle by the Japanese during World War II. Locally known as the Death Train due to the thousands of young men who died of malaria, dysentry and beatings, this is a story that is not commonly discussed in Western school books. Most know of it, if at all, only from the movie “The River Kwai”. The first place to visit is the excellent “Death Train Museum” right next to a small but moving cemetery for allied soldiers. Then take a tuk tuk out of town to the HellFire Museum. After a look around the interior exhibits, the highlight is walking the actual railroad tracks while listening to their audio guide. This walk is a unique opportunity to listen to survivors tell what they went through in their own voices as you stroll past the sylvan landscape with bamboo palms softly waving in the breeze. There are pick and chisel marks showing the meters of rock they had to blast through using only dynamite and hand tools. You hear stories of cruelty and starvation but also bravery and resistance. You won’t have time to do the whole walk if you go on one of the usual tours which include a ride on the train and a visit to the waterfalls so you might want to make this a one off and save the other sights for another day. 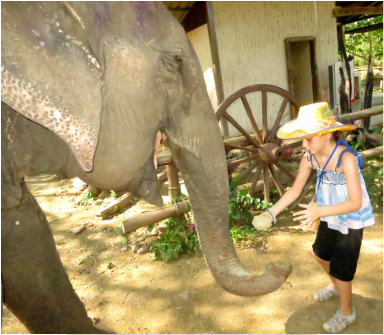 Hands down, the best thing to do in Kanchanaburi is spend a day at Elephant World. 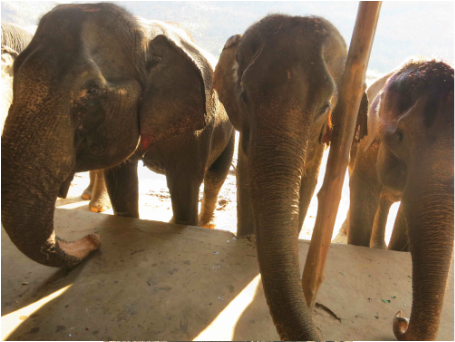 This is a great sanctuary where elephants are not required to put on a show or paint with their trunks but are actually cared for and allowed to recover from a lifetime of abuse. The founder, one of the most famous veterinarians in Thailand has found or been sent elephants who are too old or inured to be useful anymore. The elephants employed in the logging industry surprisingly were in better shape that those used to lug tourists around all day since their backs are too fragile to support the heavy howdahs filled with none too slim farangs. Pulling tons of trees or rocks is actually less damaging to them. But from a kid’s point of view this is the best place in the world to actually get to be with elephants. You spend the whole day feeding, petting, bathing one on one with the elephants. You ride on their necks down to the lake and scrub them down with their mahoots. You don’t just feed them, you go out to the field to chop down their sugar cane and cook up their sticky rice and fruit balls. There is far more hands on interaction than at most places where elephants are not treated any where near as well so it is a win win for all involved. With thousands of miles of coastland and hundreds of tiny islands it will not be hard to find a relatively uncrowded patch of sand to rest and recover from all that sight seeing and new experiences. Kids universally love beaches, ‘nough said.